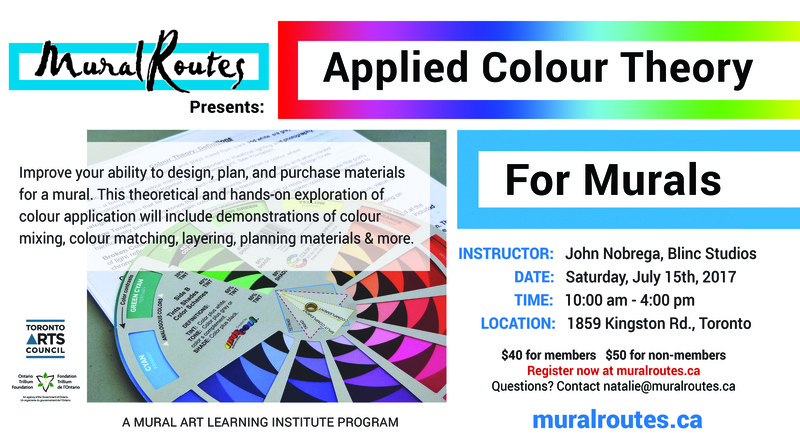 Our next workshop offers a dive into the the important topic of the use of colour for mural art. What: Improve your ability to design, plan, and purchase materials for a stunning mural with this full-day workshop. Experienced mural artist John Nobrega will lead a theoretical and hands-on exploration of colour application for mural artists, including colour mixing, colour matching, layering, planning materials, and more. Registration: $40 for Mural Routes members, $50 for non-members. Register below. The Wall Art Learning Series is part of the Mural Art Learning Institute (MURALI), a continuum of training programs in all aspects of mural-making. MURALI is generously supported by the Ontario Trillium Foundation. Graffiti Art- 2nd Workshop Added!